Bigger is better? Not for this spectacle of art. This aesthetic focuses on the art form of regular everyday things in an irregular size – specifically, incredibly small. These tiny replicas, despite being tiny, manage to draw in more attention than it they do at their regular size. For example, yesterday’s lunch? Already forgot. 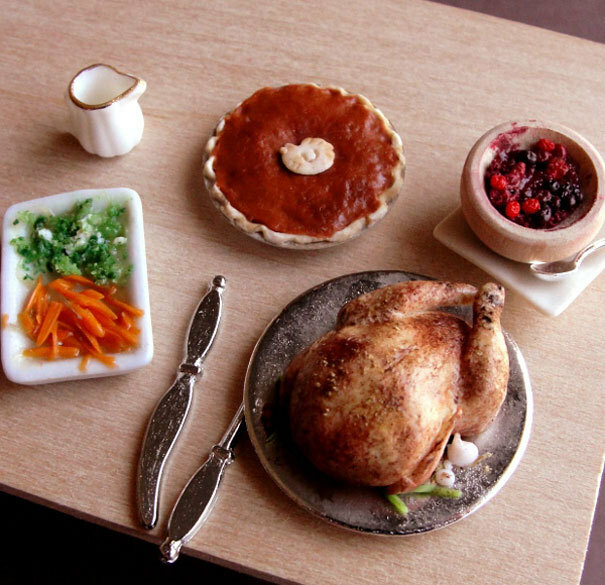 But take a gander at these miniature foods created from polymers and clay. Most of these are creations available on etsy, but these wonders are free to gazed at in awe. 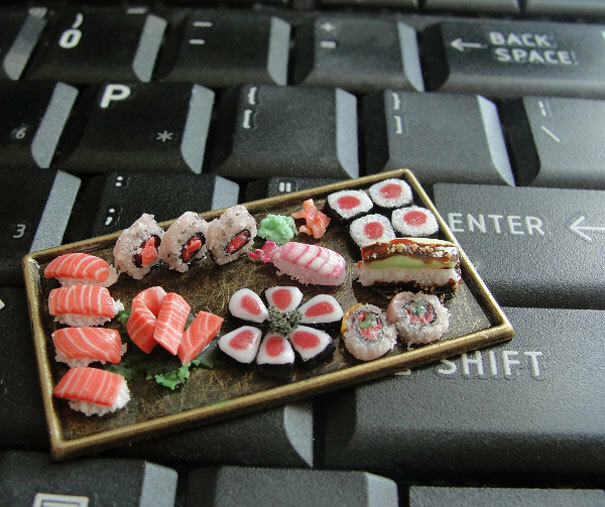 Food is one the most common miniaturized items popularized on etsy, pininterest, and tumblr. Often they are sold as jewelry such as cheesecake dangling from earrings, or a string of doughnuts on a necklace. However, nearly anything small has the aura of this cute aesthetic. Mini books, games, boats, vehicles, trees… There are multitudes upon multitubes of examples of miniature replicas with this aesthetic. Most of these can be found in doll houses, but doll houses are their own form of aesthetic. Part of what is so incredible about these extremely small replicas is the amount of time and effort that is poured into their creation. Detail is often more difficult to achieve at these tiny scales where the single incorrect flick of the wrist with a paintbrush may demolish a large portion of the final product. 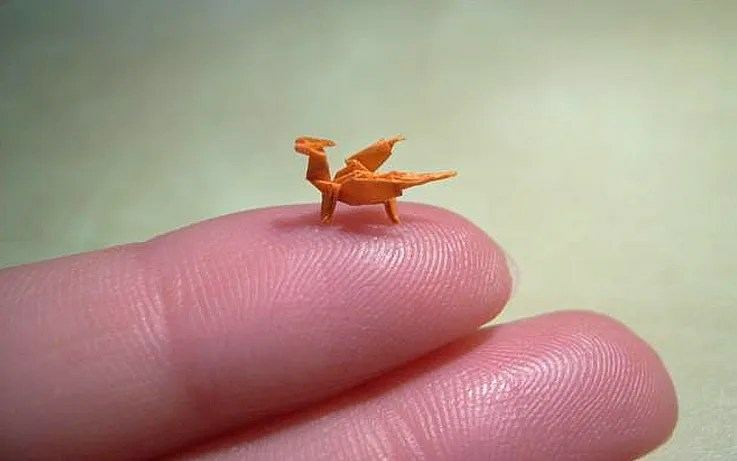 In the case of the origami, paper becomes increasingly harder to fold accurately when it is small and nearly impossible to direct the location of the crease to the correct spot. *I would like to note that the mini playstation even has a youtube video of its creation. All we need is a tiny screen and it’s game on. Here is a shout-out to an incredible creation where one artist used the tips of pencils to make miniature carvings. 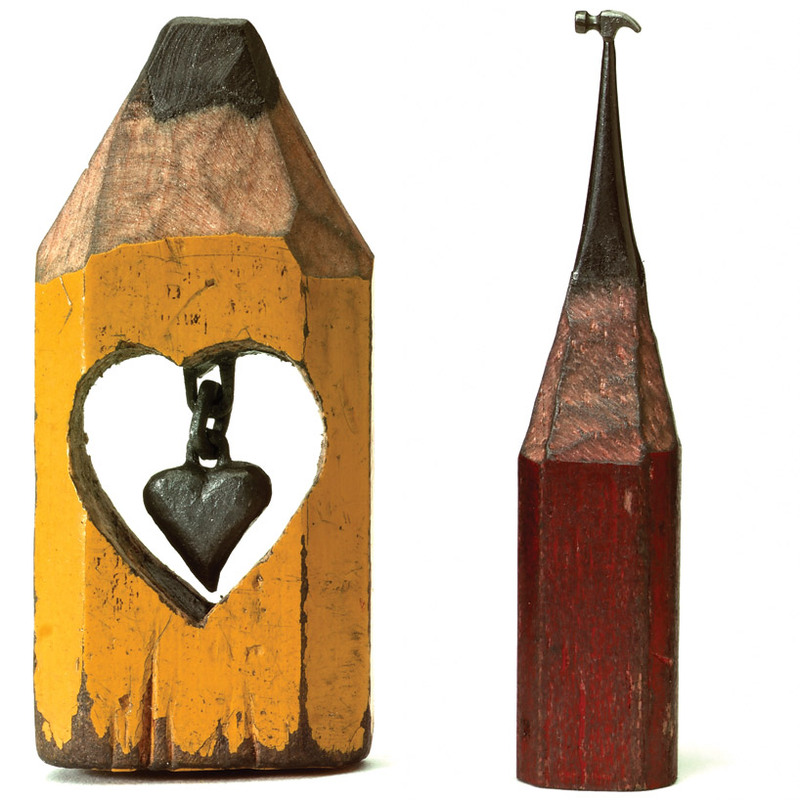 Since these are carved by hand, these pencils are also extremely delicate. Tools need to be specialized for their creation, and often magnifying glasses may need to be worn to simply even make sure the curve is to scale. One especially amazing thing this artist accomplished was carving chains from the graphite since he had to literally carve the chains to be connected rather than carve out the individual links and piece them together. So far all of the examples have been items or products. However, tiny things are not limited to just inanimate objects – even small animals carry the aesthetic of being, well, small. Often baby animals are adored for their small size. Considering deeper, perhaps small things carry a wisp of that innocence associated with babies and newborn creatures. We as humans like to protect the young, vulnerable, and innocent – perhaps we are prone to cherishing small items also due to this subconscious association? While you’re thinking, feel free to be distracted by these tiny animals. Tiny objects aren’t just an aesthetic – they are also pop culture. A meme stemmed from unusually small objects popularized on the internet goes “What is this? A ____ for Ants?”. The origin of this meme is from the movie Zoolander when the character Derek Zoolander says, “What is this? A center for ants?”. This quote become parodied across the internet as a comment toward any tiny replica of a normally larger item, except the word center is replaced by the item name. The subreddit /r/thingsforants is named after this meme but also contains posts and submissions from reddit users of their own photos of tiny things. If you haven’t had your fill of tiny things, feel free to roam the top of that subreddit. I really enjoyed this post! Have you heard of the movie Tiny Furniture? One of the characters in that movie is a photographer that creates tiny home sets to use in her photography. I actually was gifted a tiny chair from one of my friends. It is extremely detailed for how small it is. I think that that precision plays a huge role in the perceived quality of a work of art. Realism was all about that, using precision to capture authentic forms. High quality machinery, furniture, sculpture and models all value precision to produce their fidelity to an ideal. When one can take the precision of capturing an object accurately, all the while scaling it down to a level that normal human precision fails, I think it creates a really impressive aesthetic where craftsmanship and commitment to the subject are pushed to the limit. Also, there is something called tilt-shift photography. It’s an art of taking pictures of normal subjects and adjusting focus and color such that they appear to be models. There is an artists’ association for this : http://www.igma.org/, the International Guild of Miniature Artisans! This is so cool! I can’t imagine the time and patience it would take to craft one of these pieces, especially the pencil ones. Wow. The level of detail, the lack of mistakes. The artists must need to use a microscope to make some of these things. Tiny animals, of course, are so cute! My favorite small animal has to be the elephant shrew. I wouldn’t categorize them as tiny, but they are certainly small. Also, baby fish. I like the baby cichlids, as they look exactly like their parents, but like they’ve been hit by a shrink ray. Rena, I love your sense of humor, use of appropriate images to your post, and detailed explanation of the aesthetic of small things. It is incredible to think about how much detail goes into these tiny projects, and it is both the simplicity but also complexity of these tiny things that make them so aesthetically pleasing to the eye. I absolutely hate snakes, and I thought “awww” when I saw that image as well. I think as humans we like to care for things and people, and we especially love “little” things (like babies and puppies). Possibly this could be the reason why they are so aesthetically pleasing to us, because we find them cute 🙂 This reminded me of those miniature dolls that can stack inside eachother: you keep pulling them apart, thinking there won’t be one that’s any smaller and at last you come to the smallest possible doll you didn’t think was possible.